Read Part 1 of this blog – here. 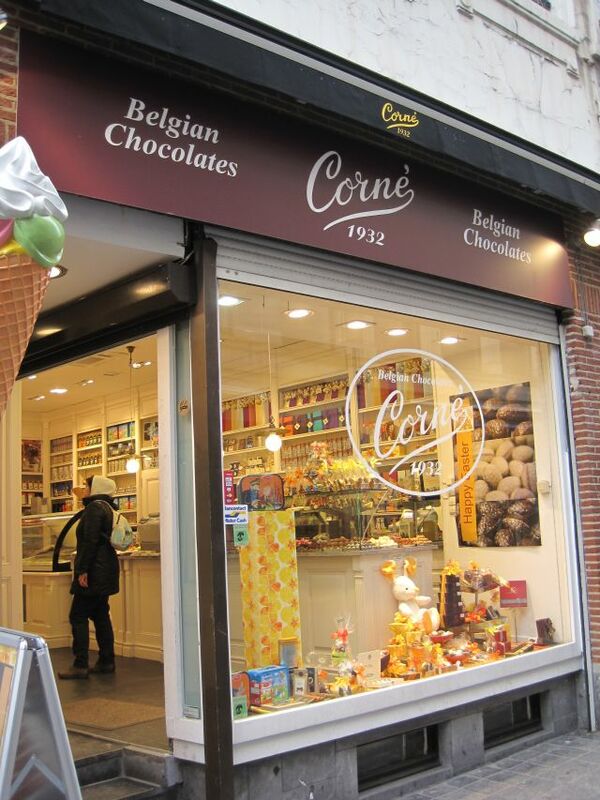 Belgium is bi-lingual so all signs and notices are in Flemish and French. Since I can speak Afrikaans I was more or less able to figure out the Flemish words. So, what to see and do? We only had a few hours at the end of each day. Heading out to the Atomium wasn’t an option. That’s the structure that looks like a huge big molecule, Google Antomium to find it. We did see it in the distance from the train when we went to Antwerp. We also saw a red light district just north of Brussels from the train window. They have windows with girls in them, exactly the same as the ones in Holland. Who knew? Fortunately our hotel gave us a map so we could find the key attractions. 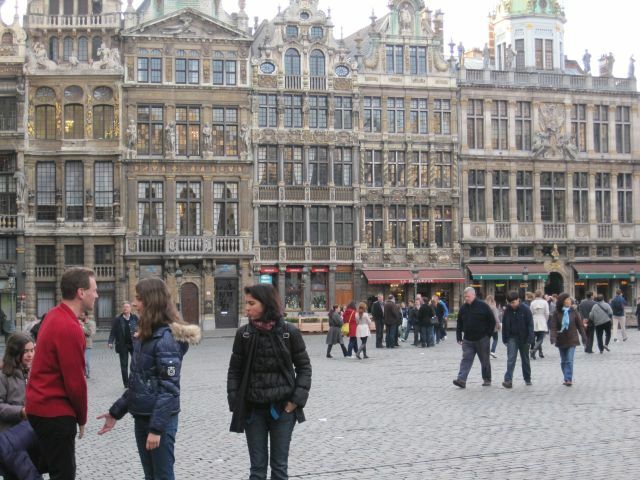 Once we got close to Grande Place/Grote Markt we encountered hoards of tourists, all with the exact same idea as us. The square is really impressive. It’s surrounded by some of the most beautiful and gilded old buildings I have ever seen. 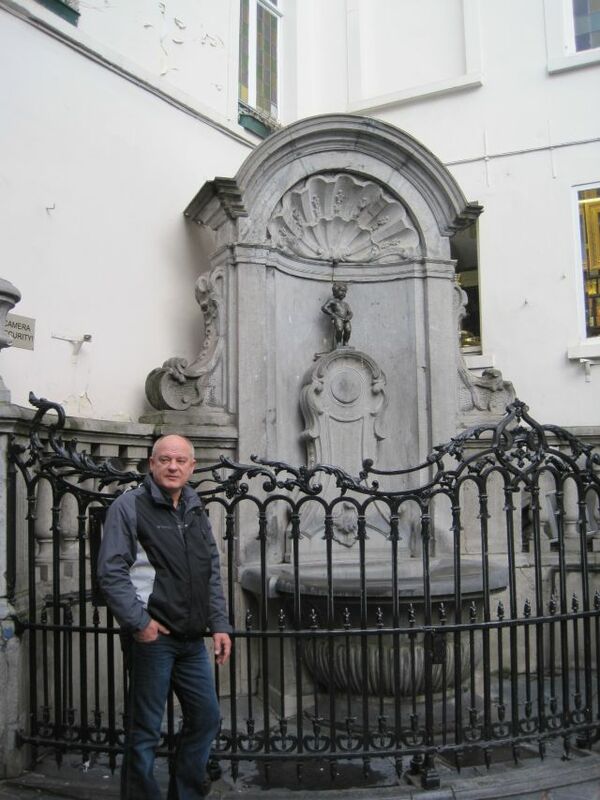 Mannekin Pis is not far away. He is much, much smaller than I was expecting. Trying to get a pic of him without other tourists posing is impossible. We wandered around this area finding pubs and shops. We noticed frescoes of Tin Tin and other cartoon characters on the buildings. Brussels has signs pointing you to the various attractions. If you can follow the signs you can see quite a bit, even at night, as we did. The following evening we went walk-about in Avenue Louise area via the Palais du Justice. I guess Avenue Louise is the Brussels version of the French Champs Elysee. All posh and pretty. 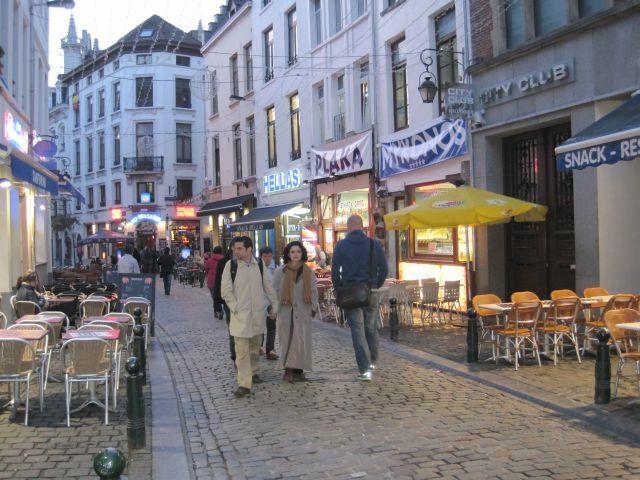 Then we walked back to a Lebanese restaurant we found the night before, near the Grand Place/Grote Markt area. It was cold, raining and we just wanted to relax and eat. After a Belgian beer and Belgian chocolate of course! What we did do – because we were viewing boats – was catch a train to Antwerp and then another to Bruges. A train trip is around €7 one way. Because Belgium is so small, the ride doesn’t take long. The great thing about getting out of Brussels was observing ordinary everyday Belgian life just outside the city and seeing the countryside. 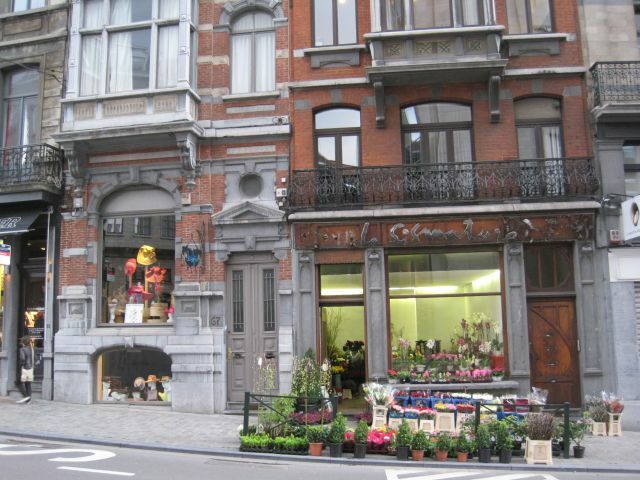 Both Antwerp and Bruges are different in character to Brussels. We had to make a detour via Ghent due to an accident on the train line. 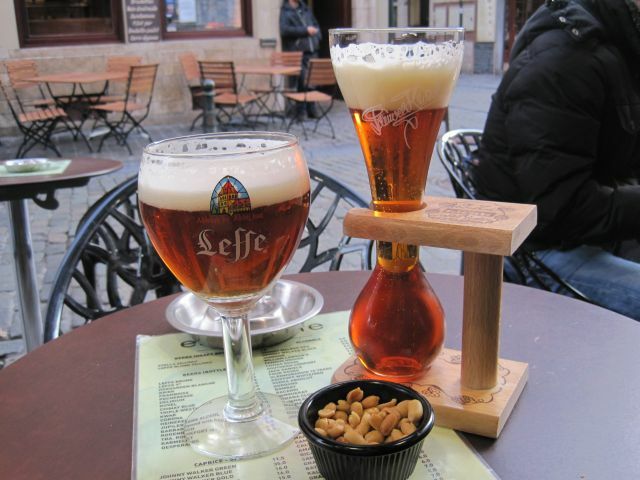 I wish we had been able to stop and see Ghent. It looked lovely. 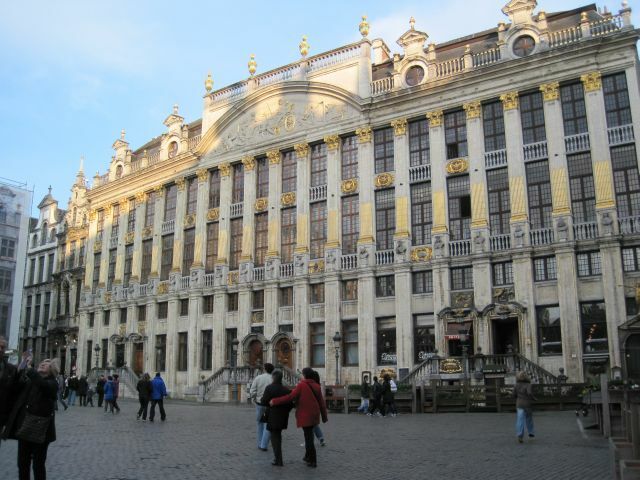 Although Brussels is the home of NATO and plenty other international headquarters, it’s a relaxed country, free of pomp and ceremony. I loved the juxtaposition of comic characters alongside awesome architecture. It’s as safe a city as you can get, and strolling about, working off beer and chocolate, is a great way to explore the city. Just don’t forget your umbrella.